Nephrite uses his most powerful Youma to target one of the animators for the new Sailor V movie. While Usagi and Luna watch an advertisement for the forthcoming Sailor V anime, two of the animators, Hiromi and Kazuko, are on their way to the studio. Hiromi is depressed, feeling that she can't satisfy the director, but Kazuko tells her to cheer up. Hiromi drops an envelope, which Ami later finds. Since it has the address of the studio on it, she decides to return it after cram school. Nephrite decides the time has come to use his strongest Youma, and predicts that Hiromi would be the ideal target. As Ami searches for the studio, she sees Nephrite driving past. In the studio, Hiromi is working alone. Frustrated, she looks at Kazuko's work, which seems much better than hers. She decides to use the professional quality pencils that she and Kazuko bought before they started work for the studio, which they promised to use only when they had become true pros. But by now, Hiromi has used up almost all of her share, and is down to her last pencil. Nephrite enters the studio, and implants his Youma into Hiromi's pencil. As he leaves, Sailor Mercury confronts him, but he tackles her and escapes. When Kazuko goes into the studio, Hiromi has become cold and ignores her. Ami returns the envelope to Kazuko, who thanks her and invites her to come again. Ami is just suspicious about what Nephrite has done in the building. Ami tells Usagi and Luna about her encounter with Nephrite, and they agree they must investigate the studio. 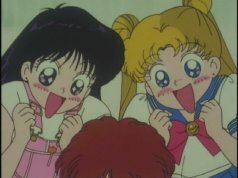 Usagi is delighted at the prospect of seeing the making of the Sailor V anime. Meanwhile, Hiromi has been working at an incredible pace, driven by her intensified jealousy towards Kazuko. Rei claims not to be interested in anime, but still meets up with Usagi, Ami, and Luna anyway, bringing a pile of autograph boards. Nephrite, meanwhile, has to contend with the curiosity of Zoisite, who is prying into his latest plan. At the studio, Rei abandons all pretense of indifference and joins Usagi in a fit of fangirlishness. Ami asks Kazuko if anything strange has happened recently, at which point Hiromi storms in and orders Usagi and Rei to keep the noise down. Kazuko protests, then the director calls Hiromi. He is pleased with her work, until she tells him that she plans to kill off Sailor V in the final scene. As Hiromi leaves, Rei senses a Youma. They catch up with her on the roof, at which point her energy peaks. She and Kazuko faint, as the twin Youma Castor and Pollux are released from the pencil. While the Senshi transform, Nephrite gloats to Zoisite that the combined power of Castor and Pollux is significantly greater than that of the Sailor Senshi. The Youma appear to have the upper hand, until they start to argue about who should deliver the finishing blow. The Senshi take advantage of this, combining their attacks to destroy Castor and Pollux. When Hiromi recovers, she admits to Kazuko that she used the pencils, but Kazuko reveals that she used hers as well, as she was worried about being left behind by Hiromi. This episode included the only instance where three Sailor Senshi attacks (Moon Tiara Action, Sabão Spray, and Fire Soul) were combined as a finishing move. This episode included the second of the three instances in which Moon Tiara Action was combined with another Sailor Senshi's attack; the others were in episode 11 and episode 24. The animators in this episode were based upon real members of the Sailor Moon animation staff: Kazuko was based on Kazuko Tadano, Hiromi on Hiromi Matsushita, and Asatou on Junichi Satou. In the episode, Asatou was preoccuppied with Sailor V's legs and was accused of wanting to make her sexier. However, according to a 1999 interview with Tadano, in reality it was she who decided to show more of the Sailor Senshi's legs by shortening their skirts. The drama CD Sound Drama Collection - Bishoujo Senshi Sailor Moon 1 revealed that Director Asatou's baby was played by Aya Hisakawa. The store Kazuko was shopping in was a parody of the 7-Eleven chain of convenience stores. "Moonlight Densetsu" was playing in the background of the preview for the Sailor V movie. The song "Tsukini Kawatte Oshioki yo" was used as background music during this episode. In the Catalan dub, the song was replaced with an instrumental version of "Otome no Policy." In the Portuguese dub, the song was replaced with an instrumental version of "Luna Luna." In the Korean dub the song was replaced with a translated version of "Moonlight Densetsu." In the Hebrew dub and Viz's English dub, the song was replaced with an instrumental version. The first English, German, and Spanish dubs removed the song entirely. This page was last edited on 6 October 2018, at 17:26.